Below is my favorite review so far. The last few lines in particular - this audience member got from the film exactly what I hoped our audiences would: hope, love and passion. I came to learn about "Women in Boxes" through my connection to the magic community. Speaking with a close friend deep in the secret societies of magic, he remarked "Did you hear about the film Women in Boxes?" The hair on the back of my neck slowly stood up, as visions began racing through my head of showgirls in feathered outfits, glitz and glam with large, boxed, and expensive illusions prancing around elaborate stages. Enough to excite even the mild magic enthusiast! There was an instant anticipation to have my curiosity satisfied and I began learning what this film was really all about. After seeing the premiere on Thursday and now reflecting on its impact, passion reached out of the screen and grabbed a hold of me right away. This is a story that no one person could have written or shared through a narrative, but a plot developed through years of relationships. It is an explanation of mankind through the eyes of working couples. Human nature feeds through all of us and she has woven her way through the women in boxes, that share physical, emotional and eventful lives with magic at the center of it all. Top hats off! CINEVEGAS PREMIERE TODAY AND WHAT'S IMPORTANT? GO TO THE BOTTOM OF THIS LONG WINDED POST TO FIND OUT HOW THE WORLD PREMIERE WAS RECEIVED. I am in the Cinevegas VIP room on their computer (in a Vera Wang gown and false eyelashes). I took me 5 tries to get the eyelashes on this morning in my hotel room; they're still crooked and why did no one notice? A Cadillac Escalade (one of the sponsors) came at 8:30 this morning to take the fiilmmakers (us) and 2 magic assistants (Deanna and Pam) to the FOX NEWS lot in Henderson. Deanna and Pam both got lost, but within minutes Deanna called us - she had arrived and wanted to know if he asked to talk to our publicist about the short cut she found to FOX. The publicist knew, but accepted the direction. Magic assistants are the ultimate caretakers and caregivers - at least their generation. I I haven't found one bimbo magic assistant yet. The RED CARPET began at one in the VIP Lounge. Everyone was on time if not early which is out of character. My mother in law, Irene, is considered a Queen of Magic. She came with John(her ex-husband) and his wife of thirty years, Cathy. They all rode up from LA in the same car. Teller was Pam Thompson's date, because her hubby is in Asia. Siegfred came and was Irene's date. 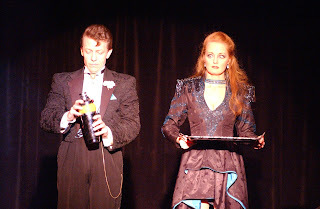 Reveen the Impossilibist and Coral arrived looking amazing, dapper and sparkly. A Latino hipster came over to Reveen the Impossibilist and praised him up and down for his suit and his LOOK. Then a photographer said Reveen and I made a nice couple. (Reveen is 70-ish). James Dimmare and Monique came with Luna Shimada (ex-wife to Dimmare) and her husband, Dirk Losander - Luna's baby was due today but her water didn't break on the red carpet as we had hoped. Burton's Babes, Connie and Karen came but I didn't recognize them out of costume. Pam Thompson brought her chihuahua in her pink purse and finally Stacy jones arrived looking stunning with Derek. Jan and Chuck Jones were here too and so clearly the whole thing was a family affair. It was great to have them all together here in Las VEgas for the purpose of celebrating their life devotion to their art - a magical life from the woman's perspective. The red carpet was crazy. We gathered into a packed house. The co-directors and I were introduced and the film began. From the opening shot to the end, there was laughter. Big! I was shocked; What is that about? During Q&A many people in the audience thanked us for making a film that made them feel happy. Filmgoers came up to us and said "We're giving your film a 5 because of how happy we are right now!" The cast was also smiling. Phewww! Relief!! I used to think (and for obvious reasons) the only valid documentary was the one that set out to expose a secret, reveal a global corporate conspiracy, or shed light on some dark issue. If it didn't make you scared for humanity, it wasn't important. It wasn't worth making if it didn't change the world. Now I think the opposite. I am tired of feeling bad and hopeless and overwhelmed with the survival of life on earth. People leaving the theatre with a smile and feeling good is important to me right now. That we feel good about life. I feel that way today. This was the best birthday present I could ask for! Saturday, May 17 MPR Nationwide. "Weekend America" Los Angeles time - 1-3pm. The link in is our NEWS box and it will give you nationwide air times. Of all the unexpected twists of fate. The intellectual value of Women in Boxes has been spotted by Nate Dimeo, one of the producers of Weekend America on NPR. Nate was hunting around the Magic Castle looking for subjects for his piece. Ironic that he was introduced to my sister-in-law Erika Larsen one night who said, "I happen to know just the person you want to talk to." He also wanted to talk to an assistant. We turned him onto Sophie Evans who works with Kevin James. He was thrilled. We sat in the "psycho Starbucks" last night, Harry, Phil and I to go over a master plan for the Women in Boxes screening at Cinevegas. Phil was jet-lagged from his trip to Poland and Harry was stressed and uptight as usual. My husband Dante - also a producer, was absent...His part in the making of the film -was that he EXISTED. Anyway our world premiere is taking place at the Cinevegas Film Festival on June 19th (encore screening on June 21). It is at the Palms. We want all the brightest and best names in magic to attend and support the Magic Gals. And we would like someone with more money than us to throw a Women in Boxes party. Criss Angel is in our film and said some great things. Maybe he will remember he is in the film and throw us a party. I want to have a marriage like Pam and Johnny Thompson. They fight throughout our entire film. It's my goal to have a marriage like that. Bickering to the sound of doves in the living room. I wish I'd grown up with them as my aunt and uncle: I would have run away to their house. They're the cool grown ups. Doves in the living room. WHY MAKE A FILM ABOUT MAGIC ASSISTANTS? With the recent, yet understandable inundation of exposes on political oppression, corporate corruption, apocalyptic warnings and global catastrophe, we wanted to make a film that gave our spirits a lift and our nerves a rest. The Life of the Magic Assistant was a concept that we we found instantly intriguing. Just when we thought everything had been said about everything, here was an untapped idea and the well was full. We embarked on our filmic quest in typical Storyteller 101 fashion, hunting for the conflict, the hook that would keep our audience engaged, hopefully glued to their seats. What we discovered in this small international community was that - due to the covert nature of Magic, there was a unique and very close camaraderie among women, almost cult-like. We found that the conflict and tension in our film was in the inherent danger of the work, their hand-to-mouth existence as live performers in a digital-centric age, and their interpersonal conflicts with and treatment by…the magician/husband they serve.In their bittersweet reflections on their lives, we discovered several anti-cliches in place within this subculture; the most refreshing anti-cliche being, the assistant is very much the one in control, in fact, the true Magician behind the Illusionist. He could not do it without her.If we have accomplished our mission, then the film has brought beauty, brevity, humanity and restored faith to our viewers that there is still Magic in the world. Over a year ago, we were on a hot pursuit to have Penn & Teller appear in our film. We were told by their gatekeeper, frankly, Penn will not speak in our film and Teller would like to, but he doesn't speak on camera. Ever! We used our family magic connections to Penn: and...they BACKFIRED. Imagine that. Now it's been a year. Our film was nearly done. We were driving from L.A. to Vegas to see my biological mother, long story, but she is to meet her grandchildren(ages 5&6)for the first time. She put us up at her gambling hole, the Orleans, for two nights. Before leaving for Vegas, I decided to try one last time for Teller! This time, I reached him directcly. He had seen our rough cut, enjoyed it and agreed to be interviewed for Women in Boxes. 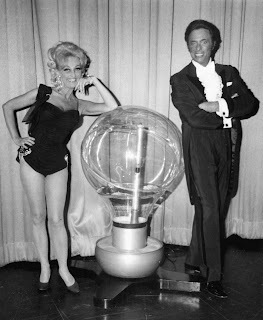 There were a few little wrinkles, like it had to be around midnight - after his show, and to stick with his Teller Mystique, he wanted to be lit in Half Shade. We didn't have our directors with us - it was the holiday. 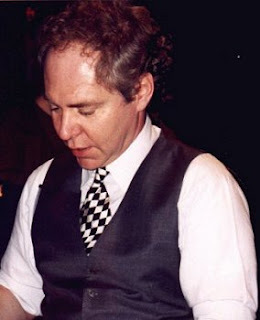 They didn't believe Teller would EVER speak to us. So meanwhile we didn't know "half-shade" from a levelor blind. I was a wreck from 3pm to MIDNIGHT. Cut to: My mother’s living room. My kids are still awake so I drugged them with Nyquil. 12:03am - Teller arrives inside the unlit and confusing maze called Spanish Trail , where everyone always gets lost. My mother was locked in the bedroom with the children - my daughter apparently said of the Nyquil "This isn't doing anything for me." My son, on the other hand, passed out cold. But two hours later, we were done. The interview was spectacular and I only wish the entire piece could be in our film. I was inspired with the idea to make a documentary about magic assistants after meeting a turbaned, bejeweled but tiny Diva of about 70, named Carol Roy. Carol is a cross between a beautiful Phyllis Diller (Phyllis you're beautiful too) and Ruth Gordon. She has spent the better part of her life curled up inside a giant light bulb until produced by her husband, Mr. Electric (Marvin Roy). Based on Carol’s participation, I knew we had a film. This woman could carry the film alone, based on personality and her stories! Our co-directors came on board based on my big pitch about Mrs. Electric. We invested in cameras, lights, hard drives, sound equipment, hotel rooms. The week before Carol’s first interview, we got a call from Mr. Electric saying she was deathly ill in the hospital. It has been two years since that call. Sadly, Carol Roy, though our film's greatest supporter and cheerleader, remains seriously ill. The film is now done, with a nod to Mrs. Electric from her peers and some beautiful footage of her popping out of the giant light bulb, which likely caused the malady she suffers from today. Trapped in a Magic Cult for life. I figured why not make a film about it. But I've seen enough magicians. Who are those female masochists?! Ahh. The wives.